The Foreign Affairs Committee of the DPRK Supreme People's Assembly has been busy sending open letters to various foreign parliaments. Our letter seems specifically tailored, as the DPRK web-based news includes parts of the other letters that aren't included in the one sent to Australia. It seems we have been saved such memorable lines as 'if warmongering Trump or the US represented by him is going to ignite nuclear war by all means, it will lead to the "total destruction" of the US, the empire of evil, and the victory of justice that gets rid of the main source of nuclear war on the earth'. In broad terms, the letter seems a tactical move consistent with North Korea's overall strategy. The letter dispenses with much of the aggression normally associated with North Korea's pronouncements. It does not ask our parliament to actually do anything, suggesting the letter is intended to set out the North Korean position – it is a diplomatic pronouncement, not a move to restart negotiations. In being ostensibly a sensible letter from the highest levels of the North Korean regime, it will have some appeal to nations (and their peoples) worried about President Donald Trump and the US more broadly. It plays upon a false dilemma: if you are opposed to Trump you must therefore be friends with us, or at least agree with us. North Korea only wants respect, to remain independent and to be at peace, the letter states – surely these are qualities all parliaments and peoples should instinctively agree with? North Korea is seeking the moral high ground in contrasting itself with Trump. The word 'dignified' is repeated twice, perhaps to help reinforce the positive image North Korea's leaders wish to project, particularly in contrast to the Trump Administration. The overall tenor of the letter will appeal to fence-sitters, but it's hard to think of any regional nations that have not already made up their minds. In more concrete terms, the letter sets the scene for later acts of the ongoing North Korean drama. The letter notes that 'the DPRK has emerged a full-fledged nuclear power...by dint of self-reliance and self-development', framing sanctions as irrelevant because North Korea's nuclear force is being developed independent of the outside world. 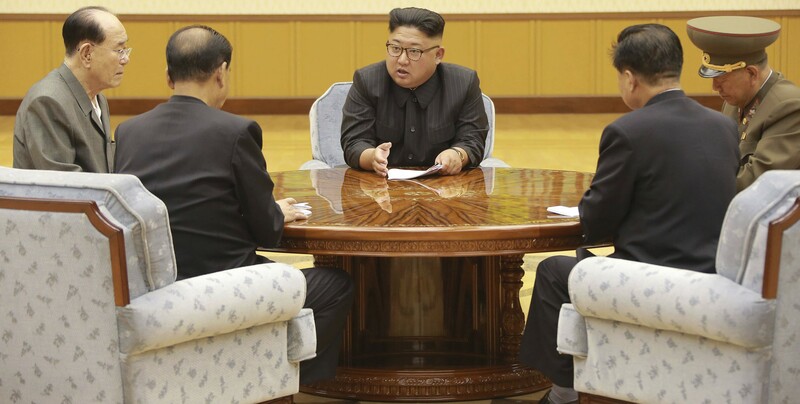 The letter says sanctions will deny the North Korean people both their 'elementary right to existence' and 'check their normal economic development' – the sanctions will impoverish the North Korean people and cause their deaths. Note, again, the claim to the moral high ground. North Korea appears to be playing for time to allow for the completion of its long-range nuclear missile force. Kim Jong-un will negotiate with other nations after he has a stronger hand, not before, and this letter is part of that strategy. Sometime further down this path – perhaps six months – pictures of starving North Koreans may be leaked to the world's media to raise the moral pressure on those who imposed sanctions that are now intentionally hurting the North Korean population. The US would thus be portrayed as both impotent and evil, unable to stop little North Korea while deliberately starving its people. In some quarters, such as the Middle East, this will play well and garner at least passive support. The appeal to UN principles is breathtakingly self-serving, given the adverse findings of the 2013 UN Report on North Korea, for which Australian High Court Judge Michael Kirby was one of the commissioners. The problem for those now instituting sanctions against North Korea is that at the time these really start to bite and those pictures of hungry North Koreans arrive is about the time US-Iran relations will be heating up. The US and Iran both claim Iraq as within their sphere of influence, and their escalating competition over Iraq seems set to bring new turmoil to the Gulf at just the wrong moment. Such timing seems more favourable for North Korea's ambitions than ours. Moreover, the letter's warning of sanctions acting 'to deny the elementary right to existence of the North Korean people' hints at a further aspect of North Korea's strategy. North Korea has yet to forcefully play the 'if you don't lift sanctions, we'll collapse' card with China, but six months from now might be about the right time to deploy this approach. With China apparently concerned about mass refugee flows across its border, this may indeed be a powerful argument to end sanctions. It might even work with Russia. This is not a desperate letter from a doomed regime, nor even a revelation that sanctions are not having a tangible impact. It seems more a muddy-the-waters letter to support North Korea's strategy of buying time until it is militarily ready.